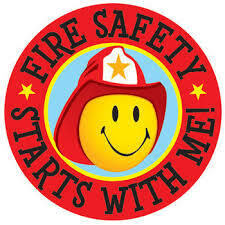 Check your smoke detector to ensure it is working and that it has fresh batteries. Don’t have a smoke detector? You should. Smoke detectors save lives. Check your Carbon Monoxide (CO) detector. You should have a detector in your home if you have any kind of device that burns fuel such as oil, kerosene, natural gas or wood. Carbon monoxide is a colorless odorless gas that kills. If you already have a CO detector, change the batteries now. If you have a fire extinguisher, get it out and check it out. Check the gauge and make sure it reads appropriately. Not sure how to read it? Bring it to us on any Thursday night at 6:30pm at the fire hall and we’ll check it for you. 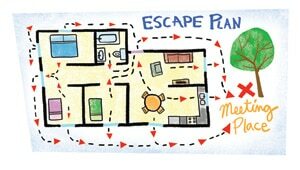 Know the escape routes out of your home to safety on all levels of your home. Everyone in your family should know where to meet in a safe spot outside your home in the event of a fire. Everyone should be accounted for. DO NOT re-enter your burning home for anything. That is our job! Limit your use of extension cords and if you must use one, make sure it is UL listed and the right size for the device you are connecting it to. Never run a cord under anything where it can be rubbed on or worn down such as carpet. Store all of your flammables and combustibles in a safe place away from other materials that are apt to burn. These materials should be preferably stored in a metal cabinet that is locked or out of the reach of children. If you must use a kerosene heater, make sure you are using the proper kerosene for heating purposes and never burn anything other than kerosene in a kerosene heater. Ensure your heater has been properly serviced and when lit, it is at least 4 feet in any direction from any other materials. Also ensure you have a working CO detector installed as well as a window cracked for a source of fresh air. If you have a fireplace, make sure you have done the annual maintenance to remove creosote build up from previous use. This will prevent a Chimney Fire from happening. You should also have the chimney mortar checked yearly for cracks and damage.